Over the weekend I tweeted about getting my Bible rebound. Since many of you asked about it I thought I'd post more information on the blog. My Bible was a gift from two dear friends after graduating from high school. Since then it's been held together with gaff tape and Elmer's glue. Sexxxy. After 15 years of writing notes in the margins I came to the conclusion that I couldn't buy a new one. After all, who throws away their Woobie? Thankfully, a friend introduced me to Danny Harris. I emailed him the above pictures of my Bible along with a description of what I wanted the new cover to look like. After finalizing a design, I shipped it to Winnsboro, TX. Less than 2 weeks later Mr. McFeely made his special delivery back to Dallas! After seeing the quality and craftsmanship of Danny's work I'm confident I made the right decision to have my Bible rebound instead of buying a new one. If you're interested in giving your Bible (or iPad) a facelift you can contact Danny at bookbacker@me.com. 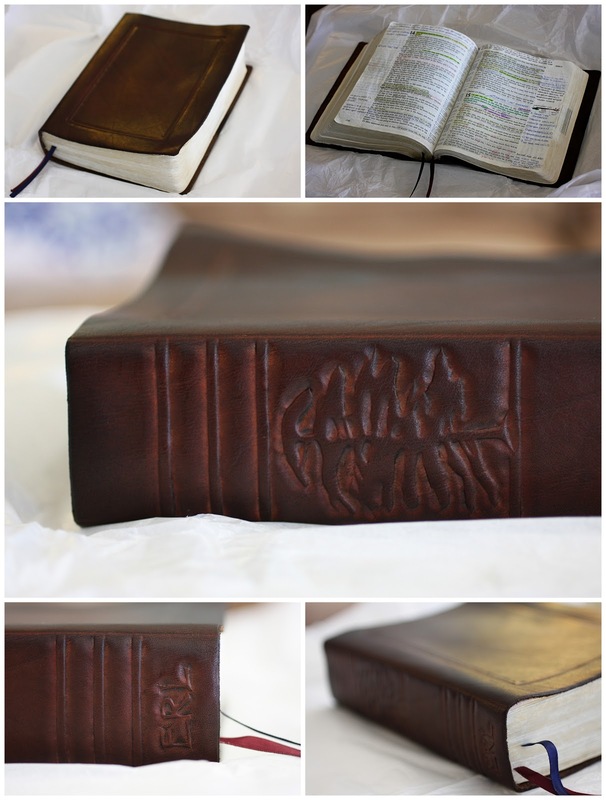 You can also check out his website www.bookbacker.com and see more "after" photos of my Bible here. Job well done, Danny! PS, only 4 more days until Christmas. Do you have any favorite Christmas Eve traditions? This year I've asked Tim to read Luke 2 with a theatrical flair. After all, we all know his history of dressing up for Christmas pageants! I remember when my Grandad gaffer taped my first bible back together again when I was about 14 or 15. The cover had been hanging by a tiny bit of paper for a few weeks and I passed my bible to my friend and the cover came off in her hand right in the middle of church! Oops! I now have a pink covered one that is pocket size and has highlighted verses and notes (Where I can fit my chunky handwriting!) and a pink neon covered copy of The Message. Making monkey bread with my Grandma ever Christmas morning, that is when she used to live with us, while mom and dad finished getting the tree ready. My parents have always given me a riddle hunt to my last present. I open a card to find a riddle that shows me where to find the next riddle, and then the next and the next, until about 15 riddles later I am at the final present. Our house isn't very large, so I commend my mother on using her imagination. And it always makes me cry because I know that she and my father stay up late on Christmas Eve setting it up. We would always get to open ONE gift on Christmas eve and it was always socks. After the first few years of starting this tradition, the socks we got had crazy Christmas designs. We'd all put them on, and mom would take a picture of us in our socks eating cookies and listening to dad read "Twas the Night Before Christmas". Eep! I didn't know this was possible! Thank you thank you thank you for sharing. I can't bear to part with my worn (but LOVED!) Bible, so this is a perfect solution. 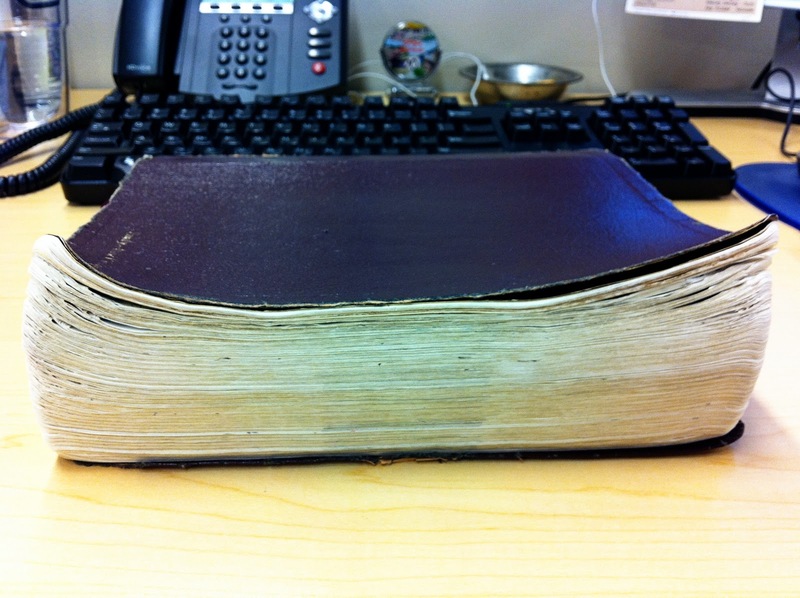 my Bible needs a facelift too, it is held together with purple duct tape right now. There is no way I want a new one, I need the reminders in the margins that I wrote myself through each sermon and study I found useful. Yours looks gorgeous!! I have been reading your blog for a while but this is my first time commenting - yay! Thanks so much for this post. My Bible was a gift from my grandparents when I was in high school...my grandfather has since passed away and I can't bring myself to get a new Bible...but it is completely falling apart. 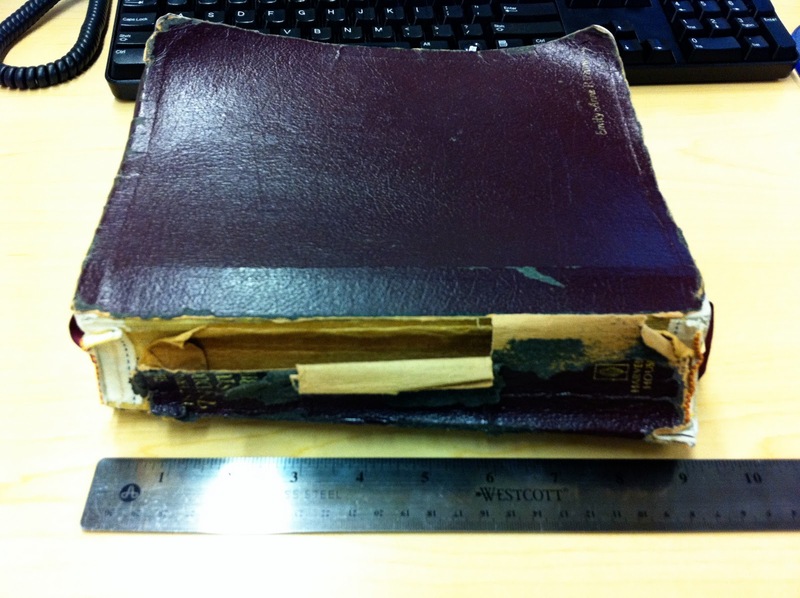 Big chunks of the New Testament have come completely out of the binding. I will get in touch with Danny. Merry Christmas! Beautiful Bible cover! Great decision on the binding. That's so sweet! I love knowing I read the blog of a woman (and man) who knows and pursues the Lord. Merry Christmas! i didn't know this was possible either. amazing. lovely. to be able to use the same bible with a new cover...wonderful. On Christmas eve we all go to church together and afterwards we all gather around the Christmas tree to sing "Silent Night" together. I love that moment when my whole family (grandparent, aunts, uncles and cousins included) is together and although most of us are not really talented singers it's the most perfect moment of the year. That is one of the coolest things that I have ever seen!!! Now, I can't wait to use my Bible more and more so I can get it recovered one day. eeeeek!! i love it!! i've contemplated buying a new Bible, but nothing feels as good as the one i've had these seventeen years. i'm thinking about contacting this guy.. my pages can't be held together by tape anymore- they're all loose pages! Emily - random question. Which version/publisher is your bible? I tried to make out what the worn & torn binding says in your pic but failed. :) I'm looking for a wide margin, no commentary/study notes version and yours looks to be the perfect margin for making notes! leila, it's NASB study bible. you'll love the wide margins! is this still a business? the website seems broken now. etsetara, honestly i'm not sure! it's been 4 years since i had my bible rebound and wasn't able to find any info on danny on google :( I'm so sorry!